Baber is on track, says sevens maestro Waisale Serevi Team Fiji men’s rugby sevens coach Gareth Baber has achieved the first of his three goals set for the year. Team Fiji men’s rugby sevens coach Gareth Baber has achieved the first of his three goals set for the year. Speaking to SUNsports yesterday, maestro Waisale Serevi said Baber is on track to guide the national sevens team to win their first ever Commonwealth Games gold medal in Gold Coast, Australia by tomorrow afternoon. “He will be achieving his second goal if it happens,” Serevi said. “The first goal was last weekend when they became the first team to win the Hong Kong 7s for the fourth year in a row. He said the players in the national 7s team have the potential to do the country proud. Serevi indicated that he was pleased with the team’s performance during the 2017/18 HSBC World Sevens Series and he commends Baber for the work he has done so far. “It takes a lot for Gareth to pick a strong 12-member squad and it is more difficult for him to pick the seven players to play on the field.” Serevi added that a lot of people have been asking him why the Fijians are getting stronger. “The strongest part of this sevens team is not the seven that plays but the full 12-member squad. “In other teams when one of the players goes down the impact players are not that good. 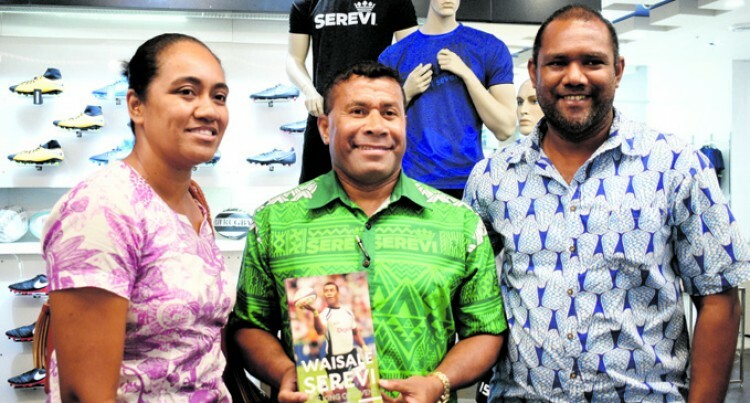 Serevi was at TappooCity for the launch of his newly released book; Waisale Serevi- The Kings of Sevens. Meanwhile, veteran forward Isake Katonibau flew out of the country yesterday to support the national sevens team in Gold Coast, Australia as their campaign starts today.